Though you might think of a headache as a common issue, it’s not normal. The most typical approach is to mask the headache with a pain reliever. Though it may seem effective, it does nothing to address the why behind your headaches and migraines. As a chiropractor, Dr. Jenna’s goal is to locate and reduce the cause of your headache. Commonly, the spinal bones in the neck have a subluxation. The subluxation can affect the muscles, nerves and blood supply to the head. You may notice that you can’t turn your head like you normally can, too. With a thorough examination, we can detect the presence of any subluxations that cause headaches. You might be surprised to learn that a headache can even result from a problem in the lower back. Your upper spine compensates for the problem, shifting your head to the side and causing a headache. 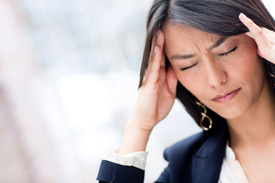 We’re fortunate to say that we have a high success rate in treating headaches and migraines. Contact Paragon Chiropractic & Wellness Center today to schedule your appointment!